It was the summer of 1941, in a small Northern Michigan resort town when Jonathan McKendry first saw the beautiful new summer resident, Emily Compton, on the deck of her father’s magnificent yacht, the EmmaLee. He could never imagine the betrayal, death and destruction that were about to come into his life. Jonathan is the son of a local boatyard owner. His small-town life seems in fine order with good friends, a local girl who loves him and bright hopes for the future. When he finds himself consumed with his infatuation for the Compton girl and he’s accused of a brutal murder, his dreams and relationships will be shattered. In a parallel story in present day, Sally Thomason is a descendant of the Compton family who first owned the great ship, EmmaLee. When a new owner returns with the boat decades later, Sally is caught up in the overwhelming emotions of a past family tragedy and her attraction to the boat’s new owner, Alex Clark. "The Seasons of the Emmalee" is a work of historical fiction, mystery and suspense. It plays out against a beautiful scenic backdrop and compelling historical context. It explores the deep and entangled emotions of class differences, family betrayal, unexpected love and shattered dreams. 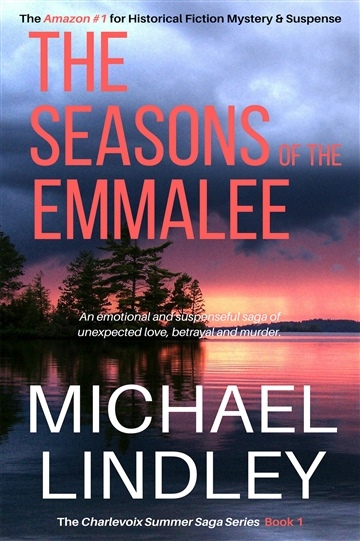 <p data-children-count="0">Michael Lindley is a #1 Amazon author for Historical Fiction Mystery Thriller & Romantic Suspense with his debut novel THE SEASONS OF THE EMMALEE. <p data-children-count="0">His subsequent novels follow this genre with his more recent, LIES WE NEVER SEE, the first in the "Hanna Walsh and Alex Frank Low Country Thriller" series, a tale of two women, generations apart facing the devasting loss of their husbands and financial ruin in Civil War-era and present-day Charleston and Pawley’s Island, South Carolina. <p data-children-count="0">The sequel, A FOLLOWING SEA, was released in January 2019.The settings for his novels include a remote resort town in Northern Michigan in the 1940’s and 50’s, Atlanta and Grayton Beach Florida in the turbulent 1920’s, and most recently, 1860's and present-day Charleston, Pawleys Island and the fictional Dugganville, South Carolina. <p data-children-count="0">Michael writes full time now in retirement from a career in Marketing and Advertising and divides his time between Northern Michigan, Colorado and Florida. He and his wife, Karen, are also on an annual quest to visit the country’s spectacular national parks. <p data-children-count="0">“You will often find that writers are compelled to write what they love to read.I’ve always been drawn to stories that are built around an idyllic time and place as much as the characters who grace these locations. As the heroes and villains come to life in my favorite stories, facing life’s challenges of love and betrayal and great danger, I also enjoy coming to deeply understand the setting for the story and how it shapes the characters and the conflicts they face.